Ann Arbor, we've got some good news. Finding professional carpet installers in Ann Arbor, Michigan just got easier. New carpet is an investment, and we aim to make getting new floors easy and affordable. We are aware that a new carpet installation can be stressful when working with the wrong flooring company. That's why we go above and beyond our competitors and offer quality brand name carpet at inexpensive prices. Voted #1 In the Reader's Choice Awards for Metro Detroit's Best Flooring Company. The Macomb Daily Newspaper has wrote multiple pieces on the many ways the carpet. We have won the Angie's List Super Service award three years in a row. We will never pressure you into making a decision. Take all the time you need. Free in-home estimates are made available seven days a week. Special finance options are available to those who qualify. We move all furniture out of the rooms that are being carpeted free of charge. Upgraded premium carpet padding is added to your purchase for no cost. A lifetime installation warranty is provided to guarantee your satisfaction. Old carpet is torn out and removed with no additional cost. It us cut up into neat bundles and placed out by the curb (if applicable). With all of the benefits customers can gain from our services, there is no reason to go anywhere else. We have gone above and beyond customer service norms to stand out above the popular big box companies. 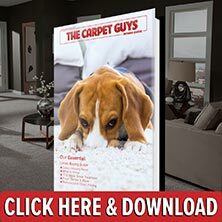 If you are ready to step into a new world of Ann Arbor carpet, take the first step with The Carpet Guys. Either call in or schedule a free in-home estimate online to get started on renovating your rooms today. For all of your carpeting needs, we've got you covered.